Learn how to set up Patient Messages (i.e. emailing secure messages and/or forms to complete at home). The Patient Messages editor will allow you create and save message templates, allowing you to have a collection of standard messages (with accompanying secure messages and/or forms) to send to patients. You will want to create these standard message templates for more efficient and standard messaging. Open the Patient Messages window. 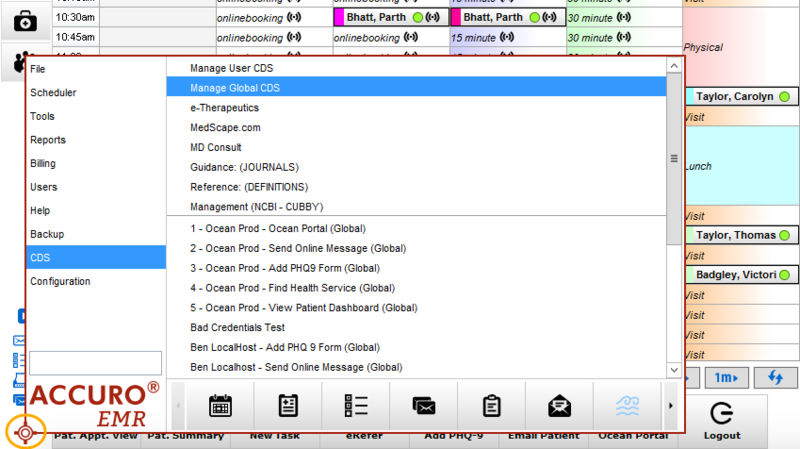 Select the tab that corresponds with the EMR that you use to learn how to open the Patient Messages window. If you are a PS Suite user, you can open the online messaging window by clicking the "Email Patient" button on the Ocean custom form or toolbar. If you are an Accuro user and you have CDS links to Ocean set up, you can access the online messaging window through your CDS link (please refer to this "Configure the CDS Menu for Quick Access to Ocean" article to learn how to set up CDS links). Alternatively, if you do not have CDS links set up, you can open the online messaging window by clicking on a patient in the Patients tab of the Ocean Portal and selecting "Email Patient...". If you are an OSCAR EMR user, you can also open the online messaging window by clicking the "Email Patient" button on the Ocean eForm or toolbar. Choose or edit and save your Patient Messages Template(s). Once the Patient Messages window is opened, a default template is automatically displayed. Generally, a clinic's default template is very basic, with a simple message in the email (i.e. no secure message selected and no forms attached). You can customize the subject header and email body to your liking and save it as your default template by selecting "Save as Default" from the dropdown menu that appears if you select "Templates" at the top right. Once you've saved your default template, you can create additional templates, which can be saved and available for use via the dropdown menu. To learn more about template management, please refer to "Patient Messages Templates". Optional alert settings and security/validation options can also be saved as part of a template. To see all configurable Patient Messages settings, please review "Patient Messages Settings". Each person who will be sending messages will be required to have their own Ocean account (for better management and auditing purposes). This is especially important if your messages are configured to alert the sender once the patient has viewed their forms and/or completed their forms. Ocean will allow an anonymous user to send a message from a patient's chart. However, it is recommended that all users have their own Ocean user account. This will allow individual users to send secure messages and to enable alerts and track activity. Any number of users can create an Ocean account, free of charge. Refer to "Adding a New User to your Site" to learn how to add users to your site. To enable your Patient Messages licence, refer to this guide: "Enabling Unlimited Patient Messages Subscriptions". Each person who will be sending messages to patients via Ocean will need to link their EMR and Ocean user accounts. This is especially important if users are subscribed to Patient Messages, to ensure that any message they send is covered under this license. We recommend that each Patient Messages sender links their EMR user account to their Ocean user account by following the steps below. This will allow individual users to send secure messages and to enable alerts and track activity. For users with Patient Messages licences, linking their EMR and Ocean accounts will also ensure that any message they send will be covered under their unlimited license. Initiating an email will open the Patient Messages editor window in an internet browser. At the top of the Patient Messages editor, you will see a banner that says: "Hello [your EMR username]. Click here to link to your Ocean account." Click this banner and sign in to Ocean with your Ocean user name and password. Your EMR username will now be linked to your Ocean user account (an accompanying Patient Messages licence, if applicable). By default, Patient Messages will appear to be sent from "no-reply@cognisantmd.com", which can be confusing for patients. Rest assured, you can change this 'From' address to your clinic's name. By default, emails sent to patients from Ocean on your behalf use "no-reply@cognisantmd.com" as the email address that the email has been sent "From". However, you can easily customize this name that appears to recipients by updating the “Email Friendly Name” field in the Admin tab of the Ocean Portal, specifically within the Site Account settings. Clinics that want to customize their “From” email address are required to have their own domain name and the ability to modify DNS records with the domain name registrar. Making this change requires that an SPF record be added indicating that the Ocean email servers are permitted to send email on your domain's behalf.